Detectives investigating an armed robbery at Aghalee Post Office on Tuesday, September 20 have appealed for witnesses to come forward. A male entered the premises armed with a handgun at approximately 9.30pm and demanded money from the owner. He made off in a silver Nissan Almera which was subsequently found burnt out in the Shankill Street area of Lurgan. 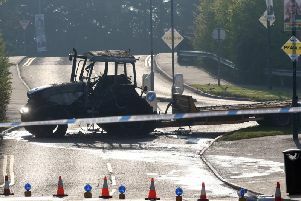 Investigating officers have appealed for anybody with information or who witnessed either the robbery or the vehicle being set on fire to contact detectives at Lisburn PSNI Station by contacting 101.